Started outof the need for straightforward sneaker news, HYPEBEAST has grown into one of the most influential media in cult, fashion, culture and pop icons. Kevin Ma started it as a blog, in 2005, from his student bedroom in Vancouver where he studied at the University of British Columbia. As a sneakerhead, Ma was always searching for news on his favorite topic but just couldn’t find the right sources. Starting a blog yourself seemed by far the best solution. In the 12 years that HYPEBEAST now exists things have changed quite a bit, just as the Internet has. The site now is a community with several media attached. On Facebook there are more than 3.2 million friends, on Instagram 3.5 million. There is a HYPEBEAST fashion shop, HBX, and there are several spin offs on the Internet. Popbee, a women’s fashion and beauty site targeting Asian countries, and in 2010 it rolled out Hypetrak, its music destination. Sneaker cult overlaps with the rap and hip-hop community, obviously. Bruil.info is delighted to present the printed HYPEBEAST to a new western audience of cult and fashion lovers. 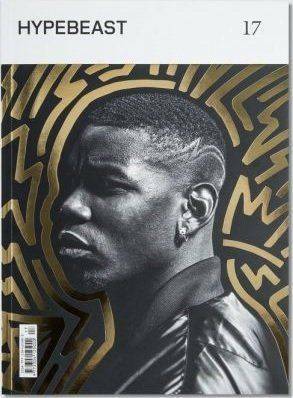 Picture – HYPEBEAST 17 – The Connection Issue – featuring soccer icon Paul Pogba.